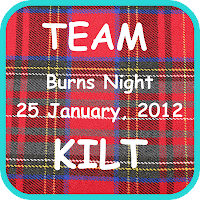 Jeri Smith-Ready: Team Kilt Burns Night--let's get this party started! 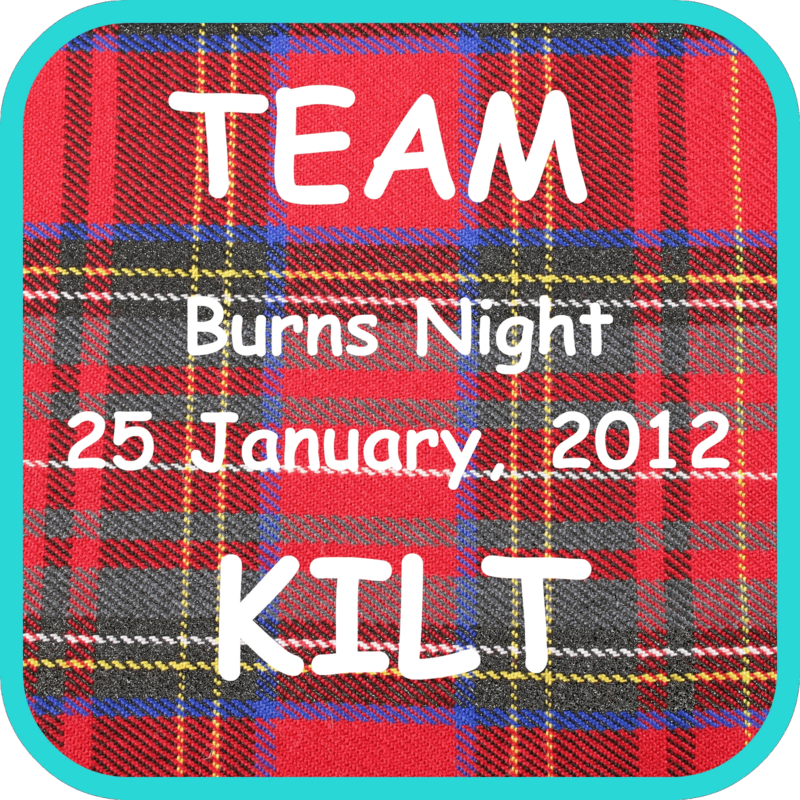 Team Kilt Burns Night--let's get this party started! It's now officially Burns Day in Scotland, so why not start the festivities now? I'm not far enough along in my deadline to justify that very expensive bottle of Glenlivet, and it's best not to drink and blog/tweet, anyway, so I'll be downing Pepsi and wishing it was Irn Bru, the national soft drink of Scotland (ten times the sugar and caffeine, or maybe I'm making that up). So, as I mentioned before, Burns Day is a significant cultural holiday in Scotland, celebrating its favorite (no, wait, since we're talking about Scotland, I'll spell it favourite--yes, AutoCorrect, I DO mean "favourite," leave me alone!) son, poet Robert Burns. I'll speak more on Burns in my All Things Scottish post, which'll go up tomorrow. But for now! I realize there's a TON of stuff going on for this party, so I'll keep this as short as possible. Many of the details on the different activities are on last week's post, so check there first if you're confused, or feel free to ask a question in the comments. I will give away 3 signed, personalized copies of the SHADE paperback to randomly drawn participants in each of these chats. Giveaway is international! ***indicates an activity in which participants will be entered to win an ARC of SHINE. See last week's post for details. This giveaway also is international. --***All Things Scottish giveaway hop, hosted by For What It's Worth. Go to the bottom of the post to see what Favorite Scottish Things people are giving away, or to link to your own giveaway. My own All Things Scottish giveaway is the complete Lord of the Rings trilogy (your choice of DVD or BluRay), in honor of Glaswegian cutie Billy Boyd (who plays Pippin). --***Get Your Scot On festival of random fun, hosted by Fictitious Delicious. Go to the bottom of the post to link to your own celebrations of Scottish culture. Anything goes! --Zachary will post songs, poems, and pics of Foods More Revolting than Haggis on the SHADEboys tumblr. --Sya at Mountains of Instead and Fraser McFarlane of Street Spirit Photography are arguing for the superiority of Edinburgh and Glasgow, respectively. 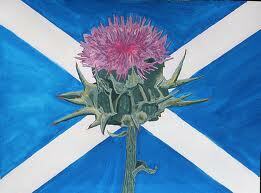 --Cyndi Tefft will post a new Scotland-related blog every two hours! --***And finally...right here, right now, the Aura in Scotland contest! Write a one- or two-paragraph description of Aura's first reaction to Scotland. Rules: There are no rules. It can be funny or poignant, dialogue or inner musings, rambling or to the point. It can be a general impression, her first taste of haggis, or how she learned the hard way to look to the right instead of left before crossing the street. Anything! Deadline: 11:59pm, Thursday, January 26. I'm giving you an extra day, because that's the generous, lazy person I am. Put your Aura in Scotland bits in the comments to this post. Unlimited entries. Each Aura in Scotland entry gets you two chances to win a SHINE ARC, and 3 commenters will each win a signed, personalized copy of the SHADE paperback. BUT WAIT! I have one more giveaway, just for Facebook users, who are often left out in the cold when we have all these Twitter parties and Blogger festivals. Since the voting is not anonymous, there's no need to tell me you voted. You enter simply by voting. Awesome, huh? Aha! I thought of something to add, or at least remind you of. I'm also giving away a bunch of exclusive TeamKilt SHADE bookplates, featuring all the various covers of the books. Which makes them, like, collectible or something. And you can ONLY get a TeamKilt bookplate at an official TeamKilt event--the next one of which will be St. Patrick's Day. Hey Jeri! I don't have time to do all the other events (WHY OH WHY SCHOOL AND FINALS WHY), but I did vote on Facebook! At least they had bothered to BlackBox -this- airport. It probably cost a fortune, but it was worth every ghost-free minute. After eight hours on a plane, the last thing that I needed to deal with was a baggage claim full of ghosts. Instead, I had to deal with a customs line and the surreal feeling of being in a place where –my- accent was the unusual one. I shifted, impatiently, ignoring the sign above our heads and checking my cell phone. Nothing. Just before reaching the exit, I ducked into the bathroom to try and scrub eight hours of stuffy airplane stink off of me. And change into my neon green mini skirt. And fix my makeup. And fix my hair. Most of the people from my flight had come and gone, leaving me with the cleaning lady and someone from a German flight. So I was stalling, just a little bit. The realization didn’t make me move any faster out of the airport. "Holy crap, is it always this cold?" I asked as I wrapped my jean jacket closer to myself. Seriously I don't know how those Scottish men do it in those kilts. I mean there's no way they could go commando in weather like this. A sudden vision came to me of an old scotsman walking down the playing bagpipes, while mooning half the neighbourhood, I smiled at the thought. With a knowing smile he wrapped an enormous and gloriously warm arm around me, "But let's see if I can get you more comfortable aye?" Yup I can definitely see me enjoying Scotland. Done with Ireland and Newgrange, I set my sights to Scotland. The fingers of guilt were still creeping into my mind over telling my Aunt Gina that I was extending my trip. I knew she saw my mother all over again, but I would not let that stop me. Simply put, there were things I wanted and things I needed. I wanted to be a good niece to her. I also wanted to see Zachary’s parents again. And I really wanted to meet Martin, but I needed more time with Zachary because he was right; Zachary was my soul mate. That alone was the deciding factor in my reasons for staying longer. Not having the extra money to fly into Glasgow, Zachary and I crossed over from Ireland to Scotland by way of the ferry, over the Irish Sea. Once in Stranraer, we boarded a train headed to Glasgow. Having been abroad once before for my great grandmother’s funeral, I found myself mesmerized by the landscapes laid out before me. Where Italy had a color pallet of Olive greens, terra cotta, pale pinks and tans, Scotland was all together different. Scotland’s pallet was alive with colors of greens, blues and sparkling white in the early morning sun. With snow capped mountains, the valleys far below were a beautiful, vibrant Kelly Green. There was a foggy mist rolling through that sparkled in the light. The contrast above was the bluest sky I had ever seen. It's true. The grass really is greener on the other side. And more lush too. I'm not sure how long I stood there staring at my surroundings, but it was awhile. Zachary stood beside me and I could feel his impatient energy growing stronger by the second until it finally manifested in the slight up and down motion of his foot. "Are ye done yet?" he asked in his gorgeous accent, slightly more pronounced than the last time I'd seen him. Without giving me a chance to answer, he said, "Come on, there's something I need to show you," and grabbed my hand, pulling me down the Scottish street. I walked through the door and was greeted by a thousand voices talking, the noise bouncing of every surface in the huge room. I glanced around, pretending to be casual about it while I looked for my greeting committee. Finally, I spotted Zach in the crowd, and I felt my face instantly break into a wide smile. I waved and started walking toward him, as fast as possible without actually running into his arms. When he hugged me, it felt like I had finally come home, and I tilted my head up to touch my lips to his, a jolt of electricity running through me at his touch. "Hi," he said smiling, his eyes twinkling. "I missed you so much," I replied, hugging him again. He chuckled, holding me close to him, then took my hand and led me out of the airport into the cool, bright morning air. Hands closed over my eyes as I was waiting for my bags to arrive. "Miss me?" A voice I love whispered in my ear. "Each and every day." I replied, turning around in his arms. Zachary. My Zachary here with me right now. I haven't felt this whole since the day he left. It was like I found my other half, the one who completes me. So far my first moments in Scotland have been amazing and I haven't even left the airport. "Aura, hey Aura! Yer spacin' out on me, are ye alright?" Zach inquired. Realizing I was still in his arms, but with a death like grip on him. "Oh" I grinned sheepishly, "Yeah, I'm fine just taking it all in." I pulled out of his arms but trapped his hand in mine. "Come on", I said pulling him along,"Let's find my bags or I'll have no clothes!" Zach suddenly pulled me against him and closed the distance between us with his lips. With his mouth pressed against mine, I felt his wicked smile. "No clothes isn't neccesarily a bad thing." Today was the day. My heart fluttered in excitement and I was nervous at the same time. My stomach was balled in one big knot and I had to keep telling myself to breathe. I'd been waiting for this for months. Although we'd shared some intimate skyping moments, it was no where near the same as being against his warm body or the feel of his breath as he had leaned in for a kiss. As I wheeled my suitcase behind me, I walked under the huge skylight through the massive terminal of the Glasgow International Airport. "I'll be waiting for you," he'd said when we'd spoken yesterday. I closed my eyes for a moment as I remembered the way his voice sounded. It was him. I sucked in a breath and came to halt. There he was ahead right where he'd said he would be. He paced back and forth, and I'd wondered if he was as excited or nervous as I was. Maybe both? He was the first sight I'd wanted to see in Scotland and oh what a sight he was. "Zach!" I shouted his name and walked faster. He turned to face me. My steps grew more rapid as his arms opened wide and a smile parted his lips. My heart skipped a beat as I said his name again. This time, I'd said it more in a whisper. "Zach." Faster I walked, until I landed in his welcomed embrace. I made my way through the terminal, weaving through the mass of people on their way to holiday destinations, laden with Christmas packages in bright paper and gaudy bows. I passed the security gate, outside of which a tree had been erected, complete with lights and decorations. Half a dozen men in red and green plaid kilts were gathered around the tree playing Silent Night on the bagpipes, in harmony. If I had already had his hand in mine, I might have been interested in huddling in with the rest of the crowd to listen to the festive music, but my eyes, my body, my heart were looking for only one thing. And he was sitting on a bench, his green eyes fixed on me, his smile brighter than any of the lights wrapped around the tree behind me. I walked towards him, wanting to hurry, but taking my time so that I could remember this feeling for as long as possible — the anticipation of his arms around me and his lips on mine. My time with him was going to be so short, I didn’t want to rush a moment of it. Forget the cookies. Forget taking it slowly. I was in his arms, kissing him, backing him up against the wall behind the bench. “I missed you Aura,” he breathed. And I realized I was in the arms of the best thing Scotland had to offer. Zach said he wanted to make a quick stop on the way home from the airport to give me a small taste of Scotland. I should have felt grimy and exhausted from the plane ride, but holding his hand for the first time in 6 months, I felt like a soda someone had shaken too hard — bubbly and tingly and nearly bursting with happiness. I didn’t care where we went as long as he didn’t let go of my hand. It was snowing — big, soft, soundless flakes — when he parked the car. In the near distance I could see a street lined with small, red, identical shops. The bare trees were wrapped in white lights and at the end of the street, a brightly lit ferris wheel was spinning. “If you promise to keep talking like that, I’ll take a spin anywhere you want me to,” I smiled as I kissed him back. I didn’t know what he had said, but it didn’t matter. His mouth was so irresistible when it was curling around words I couldn’t understand. Soon we were on the Edinburgh Wheel in our own private bucket, rising into the dark, cold sky — snowflakes dancing around us like winter butterflies. Zach pointed out a few landmarks and we watched the ice skaters below for all of 20 seconds. And then we were in each other’s arms, I was in his lap, his hands were in my jacket, my fingers were in his hair, my lips were on his mouth, and his tongue was behaving very badly indeed. I could totally get used to Scotland. It looked a little like corned beef hash. In all honesty, it looked like something that someone had already chewed, swallowed, and returned to the outside world via reversal of fortune. Even the name was offensive to my appetite. Haggis. I tried not to think of what it was, but the words ‘offal’ and ‘entrails’ kept creeping into my head. “You can do this,” I encouraged my gag reflex. “If you can rip apart and eat a crab you can stomach lamb guts” or whatever sort of guts, loins, or fat it was. I lifted the fork, dumped the lump of haggis into my mouth, chewed hastily, and swallowed. My first impression: Spicy. It was certainly no crabcake, but it was staying down. We walked through the terminal from baggage claim and into the cold, bright day. I frowned as I looked around. “What’s wrong?” Zach asked, kissing the furrow on my forehead.